A rare and unusual “Champion Sword Swallower” banner attributed to Nieman Eisman, a master of the Chicago style of banner painting from the 1920s through the mid-1950s, is up for auction this weekend at Slotin Folk Art. The circa 1930s-1940s banner conveys the danger of this sideshow act by depicting the performer downing multiple swords from his arsenal as well as a glowing neon tube. 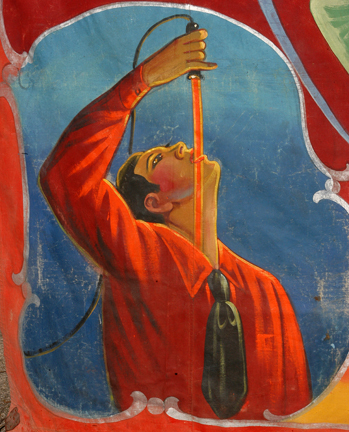 While sword swallowing is an ancient art, electricity is a potent symbol of the modern age. As soon as the neon tube was invented in 1936, neon-tube swallowing became a sideshow craze. When the stage is darkened, the eerie glow of the neon illuminates the performer’s neck and chest, making it convincingly clear that the sword swallower is not up to any tricks. When ATZ saw Johnny Meah perform this dramatic feat at the Barnum Museum a dozen years ago we were stunned. Fifteen years earlier in a carnival sideshow, a neon tube exploded inside him. When someone tried to wrench it out of his throat, shards of glass cut his windpipe. Blood gushed from his mouth onto the stage. 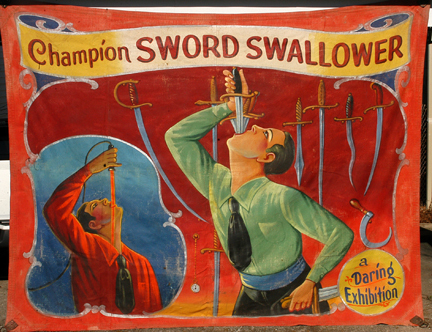 Despite the physical hazards of the profession and the potentially fatal effects of neon, the art of sword swallowing is “not totally physical. In fact, very little of it is physical,” Meah told ATZ. Among the Kings and Queens of Swords whose bravura performances with neon we’re fortunate to have seen are Natasha Veruschka (“The World’s Only Sword Swallowing Belly Dancer”), Johnny Fox, Keith Nelson of the Bindlestiff Family Circus and The Great Fredini of Coney Island USA. Although this banner was not painted for a specific performer, it reminds us of the story of Prince Neon– William Knoll — who claimed to be the world’s first neon-tube swallower. He was also presumably among the first to be injured when, in July of 1936, a two-foot-long neon tube broke inside him just before the electricity was turned on. SWORD SWALLOWER DOES IT TOO WELL, SURGEONS TAKE FOOT OF GLASS TUBING FROM STOMACH was the headline of an item that flashed across the wire. Later on, Knoll “put himself out of business” with neon as we say on the midway. 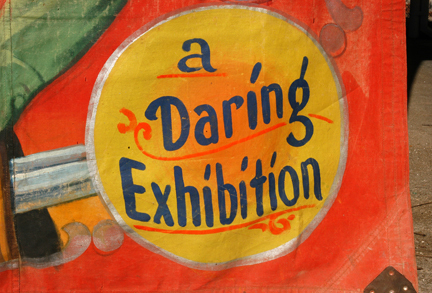 “A Daring Exhibition” indeed. In late 2003, the consignor contacted banner artist, as well as technical adviser on the HBO series “Carnivale,” Johnny Meah by email, and it was his opinion that Nieman Eisman was the artist of my banner. He later forwarded the materials to Edward “Teddy” Varndell, banner dealer and co-author of Freaks, Geeks and Strange Girls: Sideshow Banners of the Great American Midway. Mr. Varndell also believed my banner to be by Eisman. In the early 1970’s the consignor worked at a TV station in production. In the prop room behind the studio, he found this “carny” banner, back-side up, covering a pile of stacked lumber. With the station manager’s OK, he replaced it with another tarp and he has had the banner since then. During early days at the TV station, traveling carnivals or circuses would bring performers, props and animals to the TV studio for promotions (back when productions were “live”). This banner was apparently left behind during one of these shows. Johnny Meah said circus banners in the ’50s and ’60s were considered so disposable they were often used under circus trucks to sop up oil leaks. The pre-sale estimate is $3,000 – $4,000. This weekend’s folk art auction consists of 1,500 lots, with the sideshow banner set to be auctioned on Saturday. Slotin Folk Art’s live auction will be held at Historic Buford Hall in Buford, Georgia on April 21 and 22. Absentee, phone and online bidding are also available on auction days. February 25, 2012: Video: Happy International Sword Swallowers Day!